We’d had another night of high winds thrashing Billy Bailey with rain and forcing draughts in through the fridge vents. By morning, the wind had calmed and the rain had stopped as advertised by the weather forecasters. The break proved to be just an intermission, however, and the rain returned for the rest of the morning. We thought it might be an opportunity for an essentially indoor pursuit and settled upon visiting the Eden Project. We’d visited it once before a few years ago and were keen to see how things had developed. Well, to be more accurate, Carol was keen to see how things had developed. 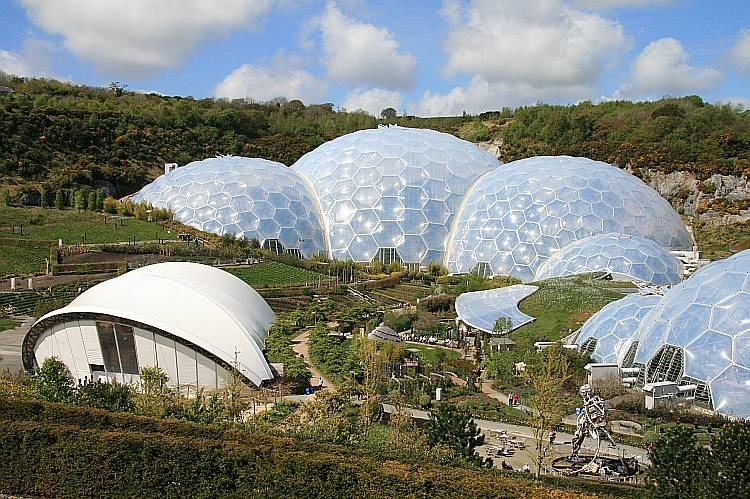 Even a passionate non-gardener such as myself can see that the Eden Project is a magnificent thing to do with an old China clay pit. The China clay workings around St. Austell may be one of Cornwall’s most striking features but they are also probably its most unattractive. Wind farms are works of art by comparison. If only projects similar to Eden could beautify the remaining scars on the landscape. The planning behind Eden was little short of magnificent. In an extraordinarily un-British way, the signing is great, the approach roads have been well conceived and there is more than ample, well-designed parking with free shuttle buses for those who prefer not to walk to or from their car. Eden is essentially an old clay pit turned into an educational landscaped garden. 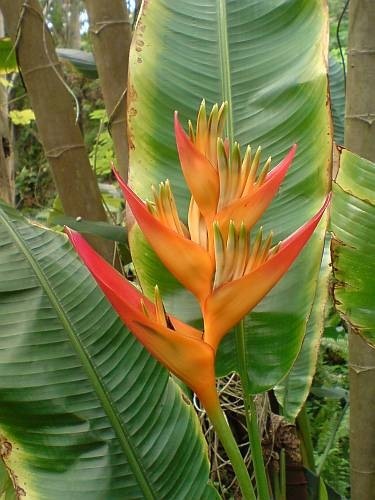 Within these open-air plantings (the so-called outdoor biome) are the most striking features, the two stunningly architected rainforest and Mediterranean biomes. The rainforest biome is really a very large, hot and humid greenhouse. The Mediterranean biome is essentially a very large, warm and dry greenhouse. 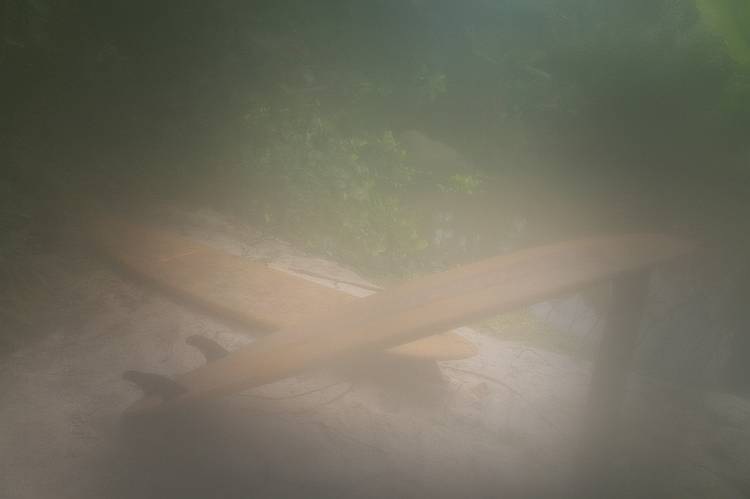 On our previous visit, the extremely hot and humid rainforest biome had potentially resulted in the terminal misting-up of Carol’s then film camera. I say “potentially” because the camera had also suffered a very cold and humid (i.e. wet) walk along some coastal cliffs in a disturbingly porous camera rucksack. In any event, having been taken out of Eden’s external cold air and into the hot and humid rainforest biome, said camera instantly misted up. It never worked properly again. What did we do this time? We went straight from the cold external air into the hot and humid rainforest biome. Carol’s replacement digital camera pretty much instantly misted up. Enter phone cam. A “real” camera, being large and bulky, takes quite a while for its mass to warm up and to acclimatize. A phoney camera, being small and light, whilst it also initially mists up, has much less mass and warms up and acclimatizes much more quickly. Carol snapped away with her phone. Carol’s new real camera did dry out and no permanent damage was done. I think the coastal path soaking was the real culprit leading to the previous camera’s demise on our earlier trip. However, I’d advise that it is pointless taking real photographic kit into the rainforest biome, at least straight from the outside biome. I’m wondering if going into the Mediterranean biome first might warm up any photographic kit and minimize the devastation of the humidity of the rainforest biome … but we haven’t tried it. My only negative is that I can’t help but wonder where Eden’s collective brains were when they built the new architectural disaster know as The Stage. Where there used to be a pleasantly soothing pool fronting the architecturally elegant biomes, there is now a white monstrosity that clashes horribly with the rest of the surroundings. It is an eyesore that detracts from everything else. It matches nothing, not even itself. It is just plain awful. Despite The Stage, Eden is brilliant and should be supported– GO!